As you know, I'm a bit of a health nut and love to work out everyday (honestly, I never skip a workout, because I actually enjoy it). 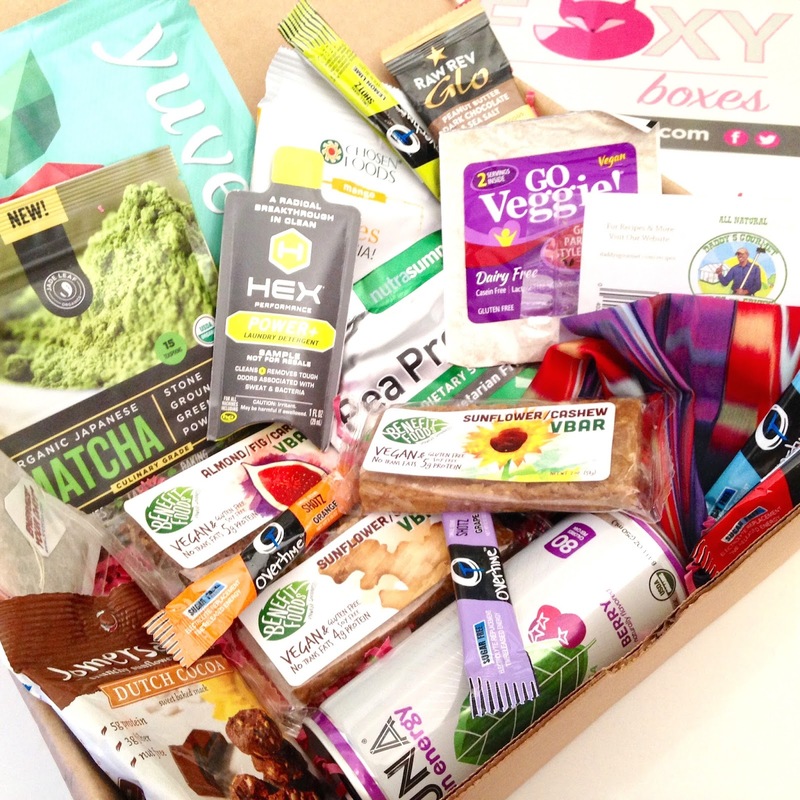 Therefore, when Jess Fisher of Foxy Boxes offered to let me try one of her subscription boxes, I quickly responded with an enthusiastic "yes" (thanks, btw). For those of you not familiar with Foxy Boxes, it's a monthly care package for women athletes. Packed with 8-10 full-size and sample-size healthy snacks, supplements, beauty products and accessories, these boxes are available in paleo, vegan, endurance and gym options for just $25.99-$29.99, depending on the length of the subscription (the product value is $50-$100, so that's a deal). I selected the vegan option, which means everything in this post will be vegan. I was so excited when the box arrived. I couldn't wait to open it. 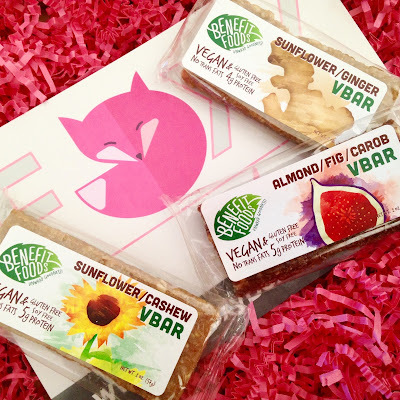 Since there is so much to see at once, let me break it down for you, starting with these yummy Benefit Foods Vbars in Sunflower/Ginger (organic crispy brown rice, sunflower seed butter, white sorghum syrup, coconut, ginger, cane sugar, raw cashews, vanilla and Himalayan sea salt), Almond/Fig/Carob (organic crispy brown rice, almond nut butter, white sorghum syrup, coconut, roasted almonds, figs, carob powder, vanilla and Himalayan sea salt) and Sunflower/Cashew (organic crispy brown rice, sunflower seed butter, white sorghum syrup, coconut, raw cashews, vanilla and Himalayan sea salt). They're vegan, gluten-free, soy-free and have 5 grams of plant-based protein from nuts and seeds. 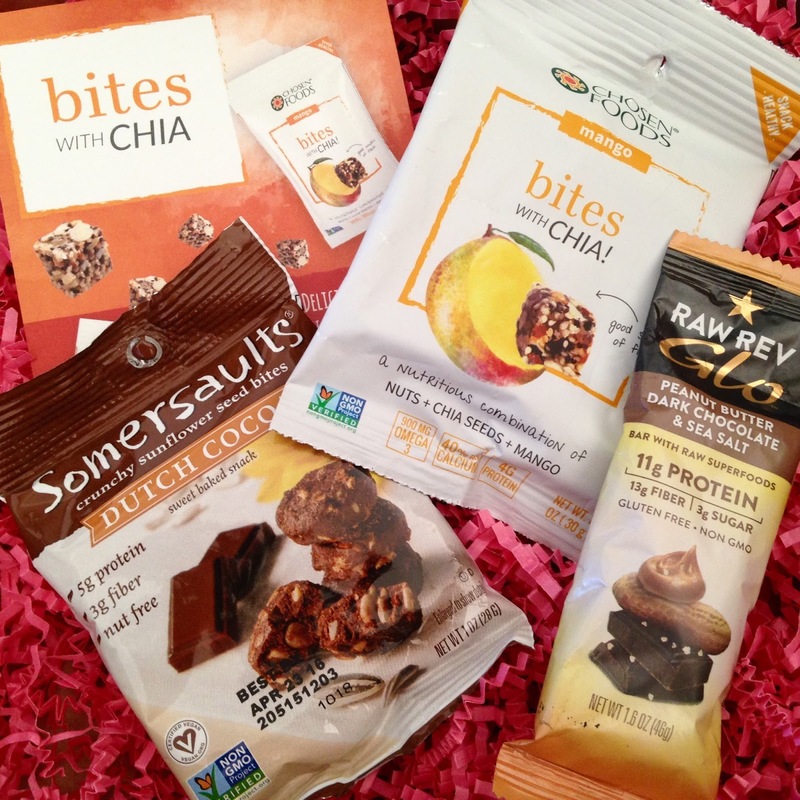 They are perfect for toting along in your purse of gym bag for a delicious, healthy snack. Continuing the chocolate trend is this pack of Somersaults Crunchy Sunflower Seed Bites in Dutch Cocoa. They are vegan, nut-free (although not gluten-free, so I'll be giving these to the kiddos), non-gmo, and contain 5 grams of plant-based protein (from sunflower seeds, of course, as well as sesame seeds). They're like teeny tiny baked chocolate cookies with crunchy sunflower seeds and only 4 grams of sugar. I've seen these on both grocery store and Target shelves. I can see my daughter and I fighting over the next snack. It's Chosen Foods Bites with Chia in Mango (we love mango in this house). They're a nutritious combination of nuts, chia seeds and mango, much like those energy bites you find in the bulk bin at the health food store (they're so good). They're vegan, non-gmo, a good source of fiber and are packed with omega3, calcium and 4 grams of plant-based protein. 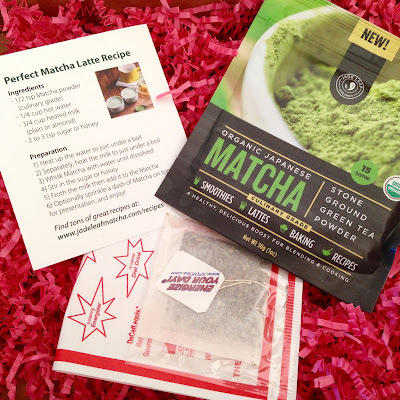 All those snacks would be nice with a cup of tea, so it's good to see this Jade Leaf Organics Japanese Matcha, along with a Perfect Matcha Latte Recipe. Although this culinary grade, stone ground green tea powder makes an energizing warm beverage, it's also great in smoothies, baking (or unbaking, if you check out my Rawdorable Take on a Green Tea Topped Vanilla Cupcake) and other recipes. This packet contains 30 servings and is all-natural, gluten-free and vegan. I also received an energizing SPORTea bag. It's green tea that's amped up with vitamin C, electrolytes and Siberian Eleuthero Root. I'm always a bit nervous about energy teas, so I may need to pass this one on to my hubby. 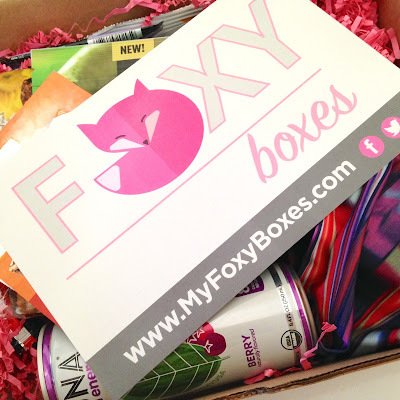 My hubby also will be the tester for the other energy-boosting products in the box (he's quite "foxy," too). The Runa Clean Energy Berry naturally flavored beverage has his name written all over it. With a total of 120mg of caffeine, this drink provides clean energy from fair trade certified, brewed organic guayusa leaves and is sweetened with organic sugar cane. 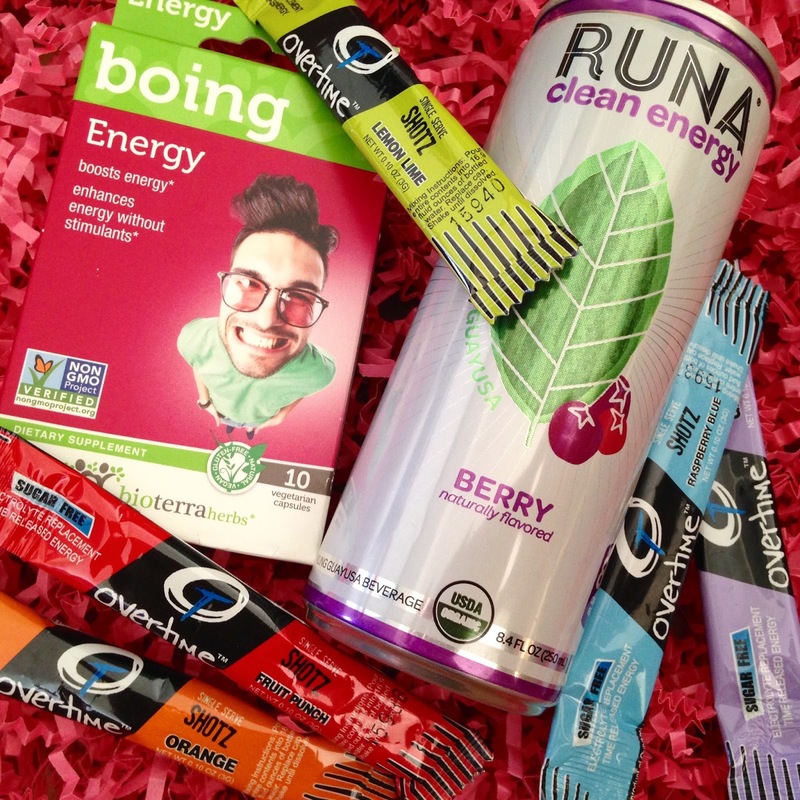 Next up is BioTerra Herbs Energy ... Boing vegan, gluten-free, natural dietary supplement. Again, I'm always a bit nervous about putting certain herbs in my body, but my hubby offered to try it. It's basically Asian ginseng (root), astragalus (root), ophiopogon (root tuber), schisandra (fruit) and grass-leaf sweetflag (rhizome). I don't know much about these ingredients, which is why I won't be trying them myself. Also in the above pic is five packets of Overtime Shotz sugar-free electrolyte replacement/time released energy in various flavors. They are single servings in Orange, Fruit Punch, Lemon Lime, Raspberry Blue and Grape. They seem to be a very convenient way to recharge after a workout, but the ingredients are not my cup of tea. I guess my hubby gets everything in that particular photo. Okay, so let's get back to some ingredients I can use, like All Natural Daddy's Gourmet Herbs and Spices, Sea Salt Infusions in Luscious Lemon. It's a combination of lemon basil, lemongrass, dry lemon and black Himalayan Sea Salt. My mouth is watering just thinking about it. 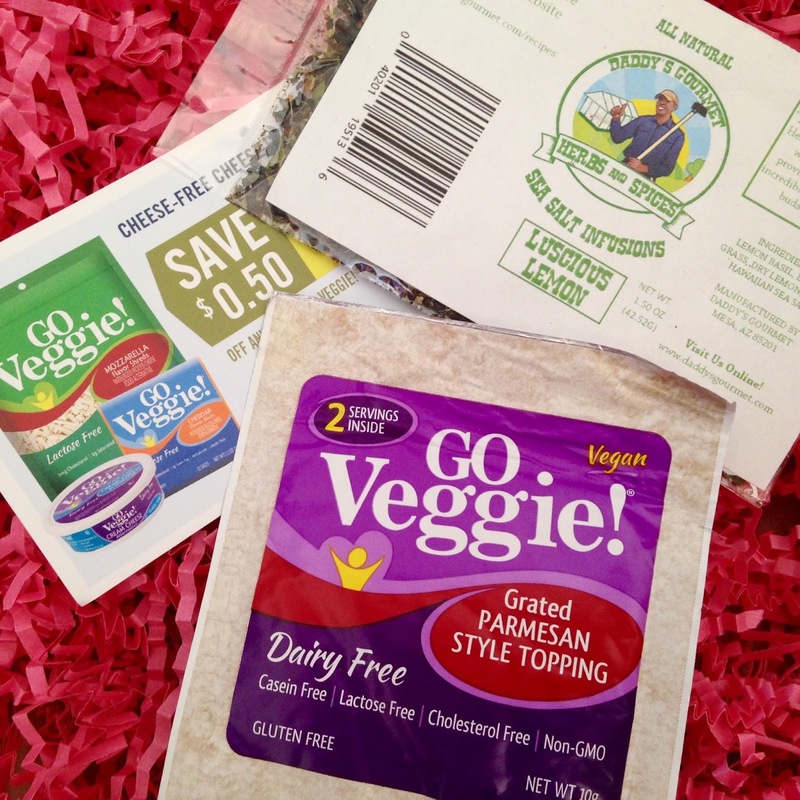 Next up is Go Veggie! Dairy-Free, Lactose-Free, Cholesterol-Free, Non-GMO Grated Parmesan Style Topping. It's gluten-free and vegan, but not soy-free. These days I limit my soy consumption, but will allow a small amount from a sprinkling of this. It's quite yummy. Most of you know that I love making smoothies with additions like plant-based protein, so I was initially happy to see the next two products in the box. The first is a packet of Yuve Raw Chia Seeds & Cocoa Plant-based Nutrition Shake. It's vegan, non-gmo, and soy-free with 16 grams of plant-based protein (pea protein and rice protein), 4 grams of fiber and 25+ superfoods. I'm not sure if it's gluten-free or not, but since it contains stevia (I didn't notice it at first; bummer), this might go to my hubby (recently I discovered that stevia bothers my stomach and gives me headaches). If it didn't have stevia, I'd try it. 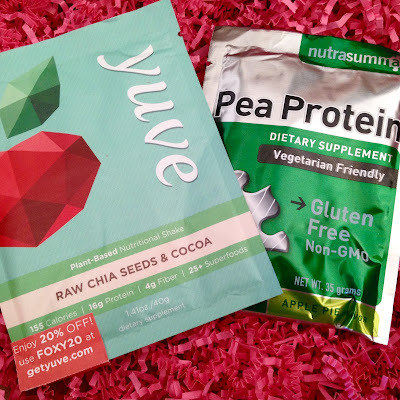 I had the same positive first impression about the NutraSumma Pea Protein in Apple Pie Flavor. It's vegan, gluten-free, soy-free, non-gmo and has 20 grams of protein. That apple pie flavor sounds delicious, but sadly, it also has stevia in it. Oh, why does everything have to contain stevia? For those of you that are not sensitive to stevia, you'd probably enjoy these products. Let me know what you think. My favorite part of this box is the fashion, of course. There's a DivaFit headband (I think mine is in Red In Motion), along with a discount coupon to DivaFit. I already used it to purchase the Midnight Mermaid leggings that you can see on the card pictured above. If it weren't for the coupon in this box, I never would have known about them. They'll probably appear in a future Instagram post. Oh, and the headband is pretty cute, too. The website sells more patterns to match all of their leggings (I might need a mermaid one; I'm a big fan of anything mermaid-themed). 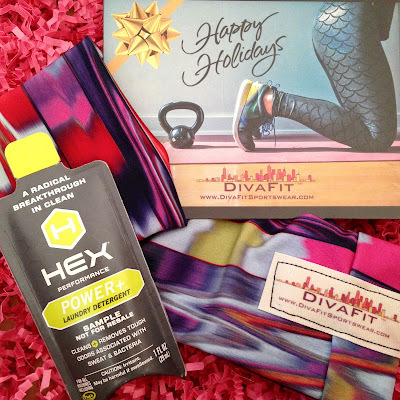 The last product is this sample of Hex Performance Power+ Laundry Detergent. It's a high performance laundry detergent with long-lasting odor eliminating technology. It's also free of dyes, perfumes and optical brighteners. I used it on my daughter's pom uniform, and now it looks and smells better than ever. I have to say that although I couldn't use some of the products in this box (I wish I wasn't sensitive to stevia), I still think the rest of the box is worth more than the price. The bars and bites are scrumptious, the matcha tea is so me, the seasonings are quite tasty, the laundry detergent came in handy, the headband is a stylish way to keep my hair out of my face and I'm anxious to get my mermaid leggings. There really is something in this box for everybody. 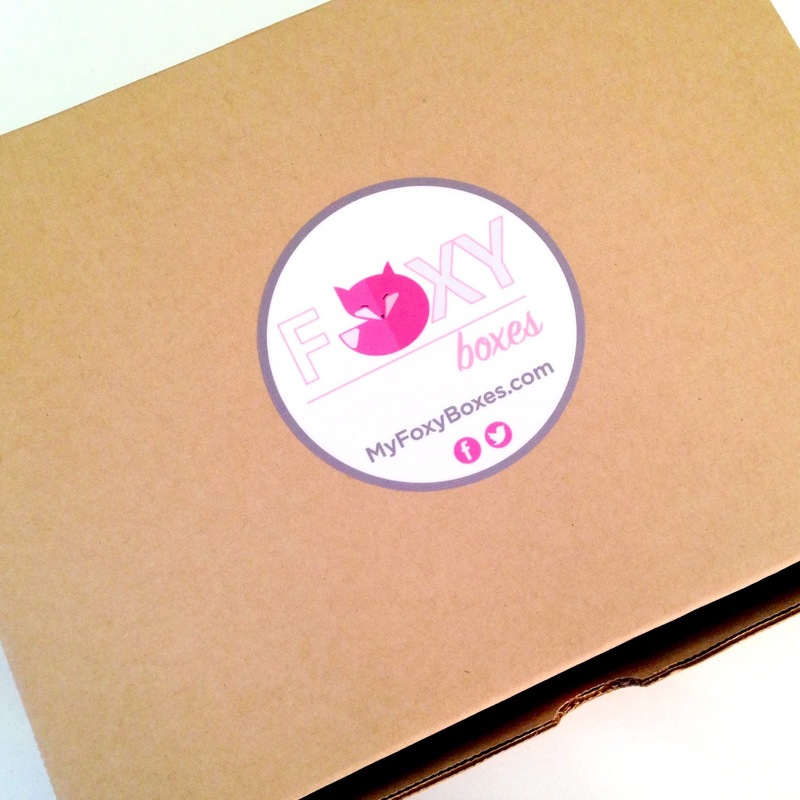 Have you tried Foxy Boxes? What are your thoughts? Let me know on Twitter at @Rawdorable and/or Instagram (also @Rawdorable). * I was sent this Foxy Boxes subscription box for review. All opinions are my own.